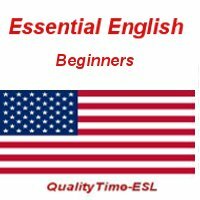 Essential English 09 - "To Like Part 1"
First the students learn the verb "like" in the affirmative with the different pronouns. Give necessary explanations in the students’ native tongue to avoid any misunderstandings or have them read in a language they comprehend. Insist on the difference in pronunciation between “like” and “likes”. Have them repeat as a group after you or after the recording. Make sure they say these forms properly even if you have to exaggerate a little. Then in pair work they practice "like" in the affirmative with the different pronouns testing each other. One student will say “I” or “he” or the other pronouns and and the second student will give the pronoun and the verb “I like”, “he likes”, etc.. You walk around the class and make sure they make the difference between “like” and “likes”. Next you make sure they understand "I like to listen to this”. And you can teach them words like music, songs, the radio. You should also teach them the verbs drink with beer, tea, coffee, Coca-Cola or whatever beverage the people of their country enjoy the most and eat with the foods they like. You should also remind them of verbs they know already like study, work, sing, dance, make cakes. They walk around using these verbs with classmates in the sentence “I like to…” followed by the different verbs. It may help to write these verbs on the board or to project them on the screen. If they ask for personal vocabulary, write it on the board and of course have them copy whatever words you have written for them into their notebooks. Then you ask them to say something about a partner with the sentence “He likes to…” or “She likes to…” followed by the different verbs. They can do this in groups of four, and at the end in front of the whole group. You go on to work on the negative form of "like", again explaining in terms they will understand. Make sure they are pronouncing “don’t like" and "doesn’t like" correctly. They practice the different pronouns with several partners testing each other. If they class is progressing well, you can work on the following pair of sentences. The 1st student will say, “I like to…”, e.g. "I like to sing", "I like to dance", "I like to make cakes", “I like to listen to the radio”, etc. And their partner should react in the negative saying "I don’t like…". They can stand up and form groups of four telling each other "He doesn’t like to…" or "She doesn’t like to…" and even "They don’t like to…"
At the end you can invite them to explain to the whole class what they like to do, what they don’t like to do or what the others like or don’t like. This can be a fun way to end the lesson. Recommendations: Be sure the students switch pairs very often until everyone has worked with everyone else several times. In this way each student will be producing the same sentences many times over, and they will feel more relaxed if they can walk around the room or at least change seats several times. It is best not to point to a student and ask the others "Does he/she like to…?" First they have not done the interrogative form of "like" as yet, and secondly it is much better to have them volunteer information about themselves as a group with “we”. Then you are not putting anyone on the spot. And they are not embarrassing their classmates in front of everyone…and the teacher! Good luck! We welcome your feedback! For information about QualityTime-ESL: The Digital Resource Book by Marianne Raynaud read the article or go to the store.